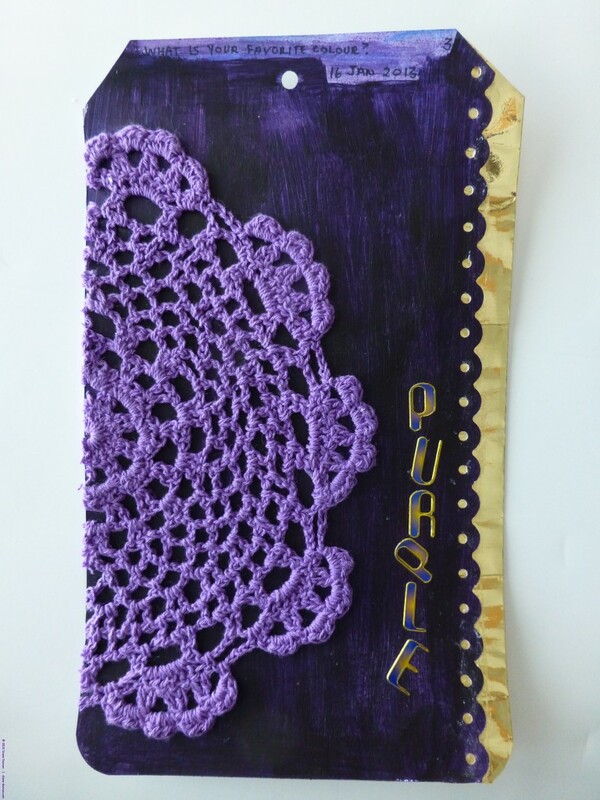 Card stock, gesso, acrylic paint, cotton doily, edge punch, metalic paper, stick-on letters. This is week 3 of a weekly art journal based on guides provided by Dale Anne Potter. All pages of this art journal are based on a tag created from card stock. For the background this week, I applied gesso and then painted the background in PURPLE – my favorite colour. The prompt was ‘What is your favorite colour?’ Although I don’t usually buy items especially for this project, I spotted this doily and decided the few pennies required would be justified. I used an edge punch along one side of the card and then folded a piece of foil paper to the width required to bring the tag back to it’s original width. A few stick-on letters completed this page.